Two years ago, a former colleague and current fallen nemesis couldn’t shut up about The Banner Saga. A turn-based strategy game with a fantasy viking setting and a story you actively take part in through conversation choices, it’s fair to say this indie effort wasn’t exactly high on my to-do list. There was no denying the game looked gorgeous, though, its art style and animation straight out of a classic Disney movie. So, now it’s on PS4 and Xbox One, having stopped off on mobiles and tablets on the way, is The Banner Saga likely to impress console gamers in the same way it did PC players? 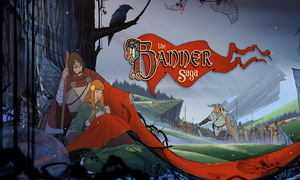 Turn-based combat can come in many forms, but The Banner Saga is of the Final Fantasy Tactics ilk, rather than something like Final Fantasy VII. If the only strategy game you’ve ever played on a console is XCOM, then this is similar in that you move characters around a grid but developer Stoic’s creation is far more attritional. XCOM’s battles also take place in large 3D environments, where the landscape plays an important part; in Banner Saga the grid is flat and far smaller, lending the combat a slight boardgame feel. The fighting initially feels quite simple, as you batter the enemy Dredge (massive, armoured foes), but soon the intricacies emerge, involving tactics on how to tackle enemies, who to use in combat, when to use special abilities, and the correct time to use Willpower to bolster Strength and movement distance. Armour and Strength are the two main stats, and Strength represents both the amount of damage you can inflict and how much health you have remaining. At the most basic level you need to position your fighting force and decide whether you should attack enemies directly or target their armour first, with your Strength stat minus your target’s Armour stat giving your damage amount. There is more to the combat than that (including a horn that replenishes Willpower but only when an ally has fallen), but I didn’t find this to be the game’s most interesting feature. That award goes to the massive amount of story and dialogue, the sense of struggle as you trudge your caravan of warriors from town to town, making game-changing choices along the way. In the beginning the wealth of new characters, terms, and locations were a bit much to process, but it settles down and you soon get into the swing of things. With its vast amount of talking and choices The Banner Saga soon starts to feel like a sequence of fairly old-school strategy game fights, bookended by life or death choose your own adventure style story segments. You’re often presented with a multitude of conversation options or choices, and it’s incredibly tough to work out which of these will be of the most benefit to your group of clansmen. Even early on it’s easy to make what you believe to be the right choice, only for a young man to die while saving his sister. While your characters can be hurt and need to recover after battle, they can’t actually die during combat. It’s in your interest to keep them as healthy as possible, as recovering at base camps takes time and resources, and once your supplies run out it’s bad news for your group of travellers who will soon starve to death. In a bizarre twist, death to your key characters comes from the choices you make, which has the adverse effect of making combat feel like it gets in the way a bit. I’d find myself just wanting to get through the battles in order to see what was coming next. Combat, then, did start to bore me slightly after a while, but there is something about the overall atmosphere that brings the entire production up. The desolate landscapes, the constant fear of death, the beautiful artwork, it’s all top notch stuff. I’m just not sure the core mechanics that make up the bulk of actual gameplay are strong enough. I certainly found more here to enjoy than I expected, and at times it’s riveting stuff, but my interest frequently dwindled as turn-based fatigue rose.